WestView Ballston in 2 sentences: WestView at Ballston Metro is a condo conversion project and is also the sister property of EastView at Ballston. WestView differentiates itself with a rooftop pool and sun deck, a renovated and welcoming lobby, and modern condos with either a balcony or sunroom that offer convenient, urban living. Area Amenities: Ballston Quarter, SER Restaurant, Zoës Kitchen, Kettler Capitals IcePlex, Ballston Farmer’s Market, Quincy Park, World of Beer, Custis Trail, Buffalo Wild Wings. 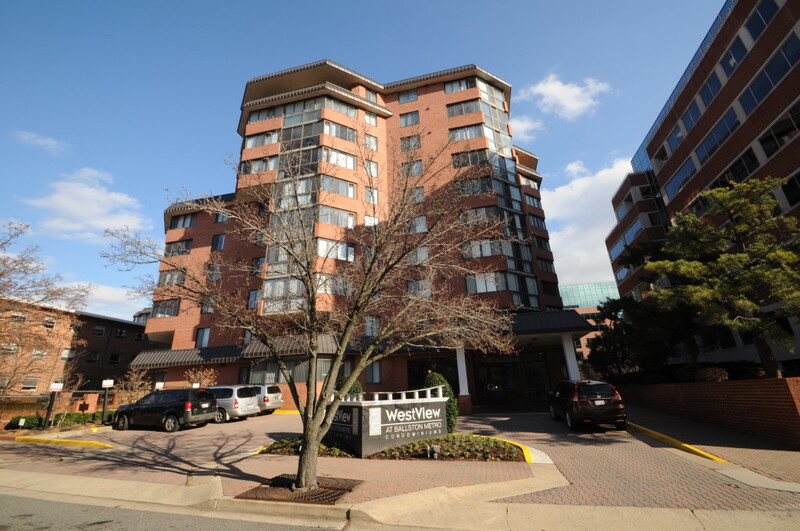 WestView at Ballston is the sister property of EastView at Ballston located three blocks away down Fairfax Drive. Just like EastView, WestView is also a condo conversion project that was completed in 2005. During the development and design phases of the communities, EastView as given a Manhattan feeling, while WestView was given a San Francisco vibe. You may see San Francisco influences and touches when you tour the community. WestView at Ballston Metro has a total of 185 residences on 10 stories. The community is the same height as EastView, but slightly smaller. There are actually two towers at WestView. The main part of WestView is located at 1001 N Vermont St, with the other section of WestView at Ballston located at 1024 N Utah St. The amenities are the first thing that stands out about WestView condos (in a good way). With WestView’s location along the north side of Fairfax Drive, you are in immediate competition with Windsor Plaza, Ballston Park, Summerwalk, The Berkeley, and EastView (all of which are condominiums located in consecutive blocks heading east from WestView). WestView has a library, a business center, a fitness center, a rooftop grilling area and deck, and finally a rooftop pool. The rooftop is one of the best in the Ballston area. I would make the argument that WestView’s rooftop is better than the rooftop at The Continental, but maybe not as good as Liberty Center’s rooftop. WestView’s rooftop is large and takes up space on top of 1001 N Vermont as well as 1024 N Utah St. On top of the Vermont St tower is the pool while on top of the Utah St tower is the grilling area. The residences at WestView at Ballston Metro will consist of one-bedroom and two-bedroom layouts. There is a good amount of variety as there are 13 floor plans to choose from. Plans will either have a balcony or more likely, a sun-room off the living space. Most condominiums will have hardwood floors, but carpet is found in a fair amount of condos as well. The kitchens are set up to accommodate a breakfast bar setup. Kitchens will also have granite countertops and a good amount of cabinet space. Sometimes a pantry can be trickier to find and the kitchens do tend to be on the smaller side. For the most part, the kitchens will be located as soon as you walk in. Most kitchens will have the open concept layout. There are a few downsides of choosing to live at the WestView condo community. The first is that some some floor plans can be a little strange. Some floor plans have larger outdoor areas which can eat into the square feet of the living space. Another downside is that some tiers look directly into the brick wall of the neighboring building. If you are on a higher floor, the issue is mitigated, but on the lower floors this could be a deal-breaker for some. And finally, the location is not the most ideal for Metro access. The reality is that it is only three blocks to the Ballston Metro, but on the other hand, there are condos in Ballston that are significantly closer to the Metro and closer to the amenities that Ballston has to offer. The best parts about living at WestView condos are the aforementioned rooftop, the rentability of the units, the sunrooms, and the location. Yes location is a pro and a con. The reason I have it as one of the best parts is that there are plans to open a new Ballston Metro entrance at the corner of N Vermont St and Fairfax Dr. Have you seen the regular Ballston Metro entrance? It needs help. Pro tip: If you are on the north side of Fairfax Drive walking toward the Metro, hop on the elevator on the corner of N Stuart and Fairfax. You’re welcome. Going back to the sunrooms, that square feet is not counted in the tax records so a lot of times your 592-square foot condominium turns into a 675-square foot condo with a formal dining room that, and here’s the kicker, you are not assessed on! Win! WestView at Ballston Metro offers reasonably-priced condos in a location that will improve in the future. A future Metro entrance and the renovation of Ballston Quarter will help the location. And WestView already stands out from its neighbors with better amenities. Although the condos will never be the biggest, the modern feel (2005) of the building along with the location make it a desirable condo community in the Ballston neighborhood.